I am turning into a pregnant lady cliche'. I'm determined to have my home organized, shops filled, projects finished and gifts sent out before Baby Coco arrives in January. To do so, I have to work on my goal everyday and I can't stop thinking about my to do list. Well, I saw this organizational project over on Pinterest and my busy body heart had to hop to it. My Mommy collects vintage sewing notions for me when she goes to yard sales in California. The embroidery thread is always a hot mess. While watching a movie with my boys last night, I turned that hot mess into a pretty mess. I can't wait to start my embroidery projects now. If you have an embroidery floss mess, try this out. All you do is wrap the thread around a clothespin and clip the end of the thread into the mouth of the pin. You'll be so happy afterwards. i LOVE that idea. i have a big bag of goodwill embroidery floss that i have been avoiding. Brilliant! Mine is always a mess of knots! I love projects like this that I can do while I watch tv, I feel less guilty! I did something similar with all my ribbon a couple of years ago. 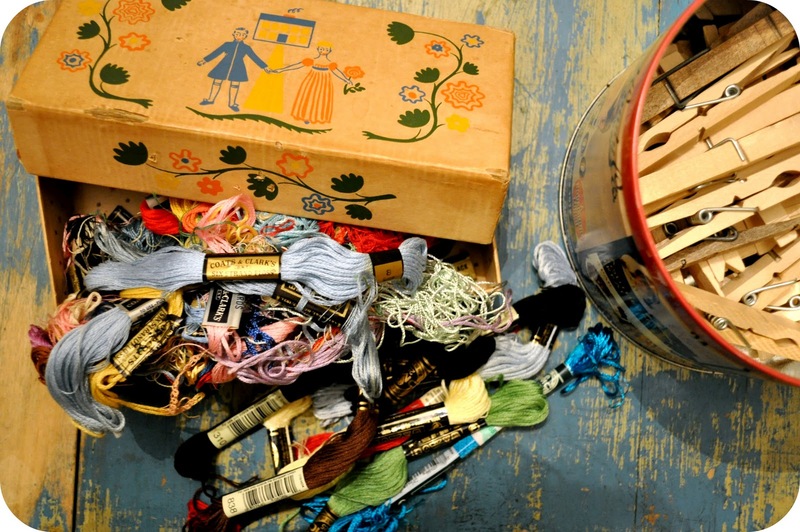 It is so much nice than just having unwinding random piles of ribbon coming off their spools. I may have to dig out my embroidery floss and do this next! that is such a smart idea! love it. I love organising embroidery thread! Is that odd? My Mum keeps hers in an organised box and I want one too just so I can look at the pretty colours and start planning ways to use it. I love pegs though, such a clever idea!